Compounds useful as photoinitiatiors and represented by the formula (I) are described: y¹ and y² are an oxygen atom, a sulfur atom, a selenium atom, a vinyl group, >C(CH₃)₂, or N-R⁷ and may be the same or different. n is 0, 1, 2, or 3, R¹ and R² are alkyl groups and at least one of R¹ and R² is a long chain alkyl groups having at least 8 carbon atoms. R³-R⁶ are selected from alkyl, aryl, aralkyl, alkaryl, alkenyl, alkynyl, alicylic, heterocyclic and allyl groups . R⁷ is a short chain alkyl groups. The present invention relates to a novel class of complexes which are useful as photoinitiators and to photohardenable compositions containing the same. U.S. 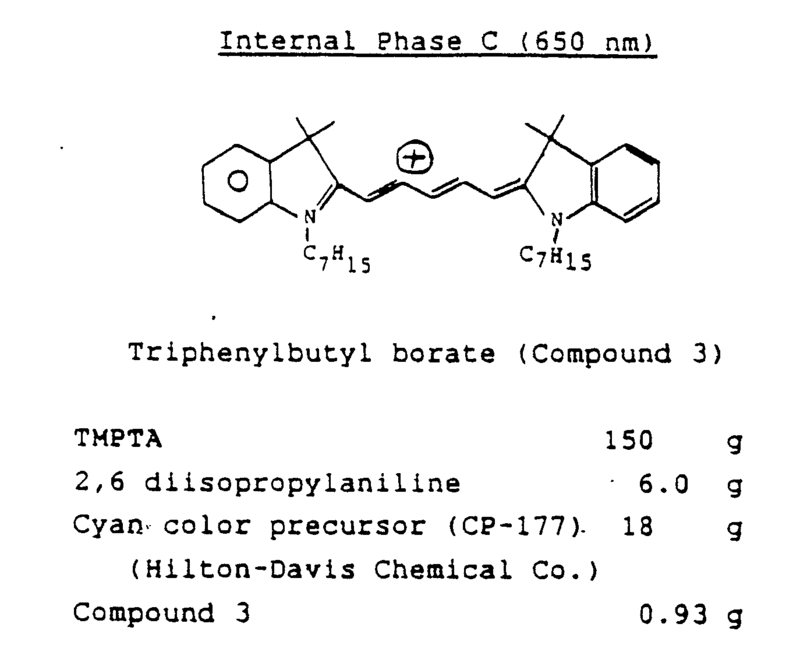 Patents 4,772,541 and 4,772,530 to The Mead Corporation disclose a novel class of photoinitiators which are compounds consisting of charged photoreducible or photooxidizable dyes and a counter ion which absorb light and generate a free radical. The preferred photoinitiators are complexes of a cationic dye and a borate anion. While these photoinitiators are suitable for many applications there is a desire to design photoinitiators which provide higher film speeds. One factor which has limited the film speeds achievable with these initiators is their limited solubility in monomers such as acrylates and methacrylates. The present invention arises from our work seeking to provide photoinitiators which exhibit higher solubility in common monomers and provide higher film speeds. where y¹ and y² are an oxygen atom, a sulfur atom, a selenium atom, a vinyl group, >C(CH₃)₂, or N-R⁷ and may be the same or different; n is 0, 1, 2, or 3; R¹ and R² are alkyl groups and at least one of R¹ and R² is a long chain alkyl groups having at least 8 carbon atoms; and R³-R⁶ are selected from alkyl, aryl, aralkyl, alkaryl, alkenyl, alkynyl, alicylic, heterocyclic and allyl groups, and R⁷ is a short chain alkyl groups (i.e. 1 to 6 carbon atoms). We believe, in addition to enhancing the solubility, having long alkyl chains for R¹ and R² may also increase photospeed by increasing the excited singlet state lifetime of the dye. The long chains should inhibit bond rotation within the polymethine section of the dye -- a known form of excited state deactivation. This effect would be more pronounced in viscous media as in the formulations described in detail hereinbelow. The invention also extends to photohardenable compositions containing a photoinitiator of the formula (I); and to photosensitive material comprising a support having a layer of the aforesaid photohardenable composition on the surface thereof. 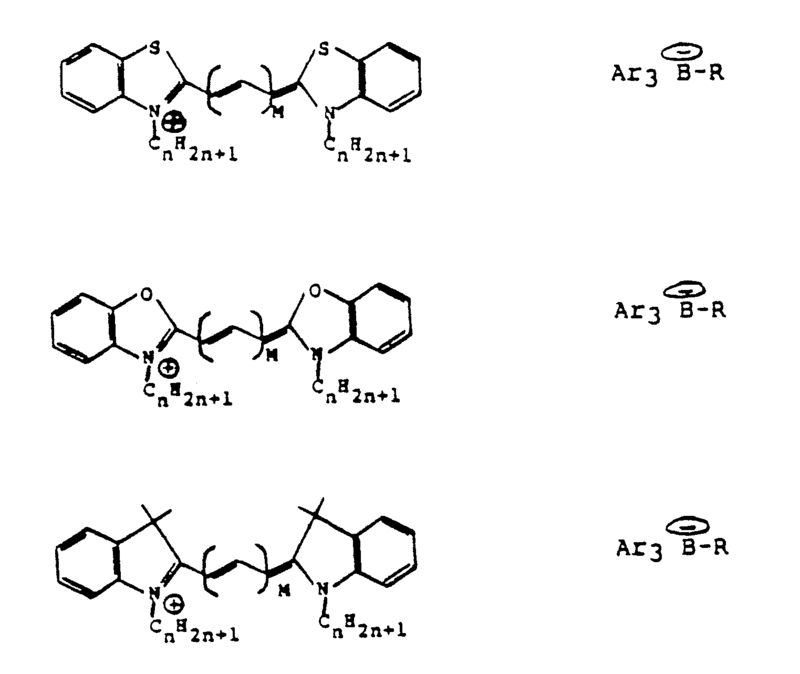 Methods useful in making photoinitiators in accordance with the present invention, and typical photohardenable compositions and photosensitive materials using same are described in U.S. Patents 4,772,530 and 4,772,541 the disclosures of each of which are to be regarded as incorporated herein by reference. The present photoinitiators include at least one long chain alkyl group at R¹ and/or R². The alkyl groups represented by R¹ and R² may be straight chain, branched chain, or cyclic alkyl groups suitably having 1 to 20 carbon atoms, provided at least one of R¹ and R² contains at least 8, preferably at least 10, and more preferably at least 12 carbon atoms. Preferably one of R³-R⁶ is an alkyl group and the others are aryl groups. Still more preferably one of R³-R⁶ is a primary or secondary alkyl group having 3 to 10 carbon atoms and the others are a phenyl group, an anisyl group, halogenated aryl group, alkylaryl group, or naphthyl group. where m is 0, 1, or 2, n is greater than or equal to 8, R is a primary or secondary alkyl group having 4 to 10 carbon atoms, a cycloalkyl group having 5 to 7 carbon atoms, a benzyl group, or an allyl group and Ar is a phenyl group or an anisyl group. As indicated in U.S. Patent 4,772,541 it is often desirable to use a coinitiator or an autoxidizer in combination with dye-borate initiators. 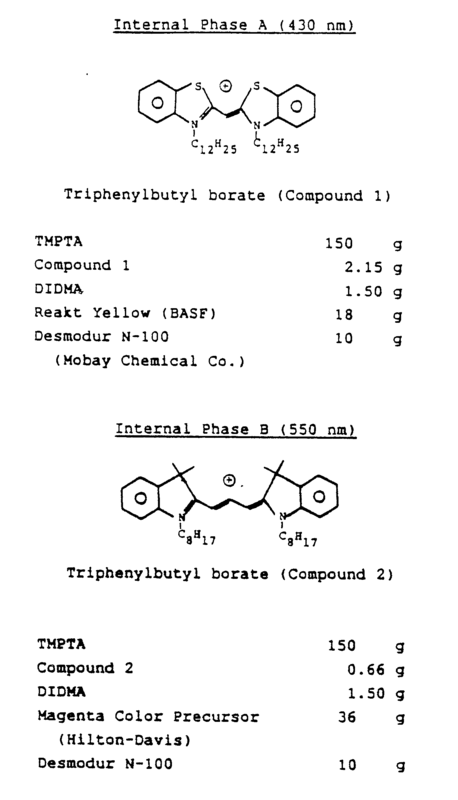 A particularly preferred compound is a thiol selected from mercaptobenzoxazoles, mercaptotetrazines and mercaptotriazines and mercaptobenzothiazoles or an N,N-­dialkylaniline as described in the aforementioned patent. Representative examples include: 2-mercaptobenzothiazole, 6-ethoxy-2-mercaptobenzothiazole, 2-mercaptobenzoxazole, 4-methyl-4H-1,2,4-triazole-3-thiol, 2-mercapto-­1-methylimidazole, 2-mercapto-5-methylthio-­1,3,4-thiadiazole, 5-n-butylthio-2-mercapto-­1,3,4-thiadiazole, 4-methoxybenzenethiol, 1-phenyl-1H-­tetrazole-5-thiol, 4-phenyl-4H-1,2,4-triazole-3-thiol, 2-mercaptobenzimidazole, pentaerythritol tetrakis (mercaptoacetate), pentaerythritol tetrakis (3-mercaptoproprionate), trimethylolpropane tris (mercapto­acetate), 4-acetamidothiophenol, mercaptosuccinic acid, dodecanethiol, 2-mercaptopyridine, 4-mercaptopyridine, 2-mercapto-3H-quinazoline, and 2-mercaptothiazoline. The present photohardenable compositions are preferably microencapsulated and used in the full colour panchromatic imaging system described in U.S. Patent 4,772,541. A preferred method for microencapsulating the composition is described in our European Patent Application No. 88311479.5 (Publication No. EP-A-­0319337). A preferred developer material is described in our European Patent Specification EP-A-0260129. The example illustrates an embodiment of a photosensitive material in accordance with the present invention. A. The following oily internal phase compositions were prepared and preheated to 60°C. C. External continuous phase is brought to 3000 rpm. D. The internal phase material was added into a mixing continuous phase. E. 3000 rpm mixing maintained for 15 minutes after oil phase addition. F. 246g melamine-formaldehyde precondensate is added to emulsion with mixing at 1500 rpm. G. pH is adjusted to pH 6.0. H. Reaction mixture is covered and held at 70°C for 1 hour while mixing. J. The pH is adjusted to about 9.5 with NaOH (20% solution), covered and allowed to cool while mixing gently. The process is repeated for each internal phase composition to prepare three batches of microcapsules. Once prepared, the microcapsules are blended in an amount which provides good color balance, coated on a sheet of aluminized polyethylene terephthalate, and dried to provide a visible light sensitive, panchromatic photosensitive material. 2. A compound according to Claim 1 when one of R³-R⁶ is an alkyl group and the others are each an aryl group. 3. A compound according to Claim 1, wherein one of R³-R⁶ is an alkyl group and the others are each phenyl groups. 4. A compound according to any preceding claim, wherein R¹ and R² each contain at least 10 carbon atoms. 5. A compound according to Claim 4, wherein R¹ or R² each contain at least 12 carbon atoms. 6. A photohardenable composition comprising: a free radical polymerizable or crosslinkable compound and a compound according to any preceding claim. 7. Photosensitive material comprising a support having a layer of a photohardenable composition according to Claim 6 on the surface thereof. 8. Photosensitive material according to Claim 7, wherein said photohardenable composition is microencapsulated.